In today’s ever-increasing advertising landscape, SEO competitive analysis is essential to the success of any website. Competitive analysis can be as in-depth and scientific as needed, and the process truly never ends as new competition pops up and current competition shifts. Let’s explore what we mean by “SEO competitive analysis,” its purpose, its techniques, its goals and the positive effects it can have on your website. What is Competitive Analysis in SEO? In the prism of SEO, competitive analysis involves analyzing competitors’ websites to learn their strengths and weaknesses of attracting organic traffic and generating leads. This is all in an effort to find new organic traffic opportunities, navigation ideas and content ideas for your own website. And it’s not simply measuring how your website stacks up against similar-sized companies; it’s comparing your website to ALL other websites who represent your industry. We are interested in the major players, the up-and-comers, the flavors of the month, and even the lowly websites – all to gain knowledge and data on what works and what doesn’t. Analyzing websites without much of an organic footprint can serve as a cautionary tale of what not to do with our SEO. However, the bulk of research should be dedicated to those with similar or better SEO success than you to gather ideas on how to better your website. 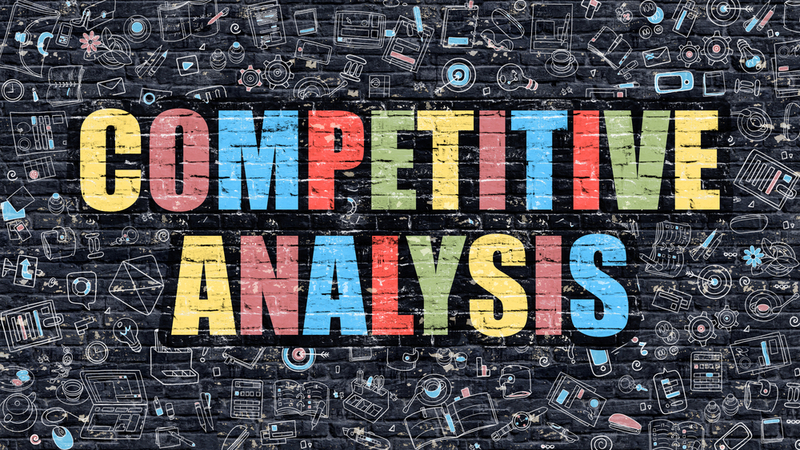 How Does Competitive Analysis Work? Since competitive analysis is all about generating knowledge and new ideas, many different techniques can be applied to achieve your goals. And because there isn’t a “one-size fits all” solution, instead of providing a step-by-step competitive analysis walkthrough, let’s explore the requirements as a whole of performing a successful SEO competitive analysis campaign. Then, it’s up to you to choose which techniques are applicable to your competitive analysis campaign and in the order they should be performed. The more “scientific” side of the equation, quantitative SEO competitive analysis focuses on the facts, numbers and data of related websites. This information can often be tracked and studied over a period of time to better understand the field of competition. Some of The frank Agency’s favorite competitive analysis tools to use for quantitative analysis include MOZ, SEMRush, BrightEdge and Raven Tools, just to name a few. There are a few things to keep in mind about SEO tools for competitive analysis. There are a lot. Don’t feel the need to sign up for every one of them. Do your research and find out which ones offer the features you are looking for and which ones are most user-friendly. Not all data is public. For example, most organic traffic figures produced by an SEO tool on one of your competitors is likely estimated traffic based on keyword rankings and search volume. Specific traffic and other website metrics can usually only be retrieved by attaching a Google Analytics account to the tool. Unless your competitor is feeling especially friendly, you will likely only have access to traffic estimates. Track Competition. Many SEO tools allow you to track several competing websites, providing you an overall view of the competitive landscape. Goals. Not only will you fully understand the keywords your competitors are vying for, but you’ll also understand who’s ahead of you in the rankings and for which keywords. You can then aim for the competitors ahead of you as well as for the keywords important to your organization. Keyword insight. Rather than knowing just a few chapters, it’s important to know the full story of the keywords in your industry. Competitive keyword analysis will help you complete this story, as you’ll find that many of your competitors rank for different search terms—some of which you may add to your own list of targeted keywords. In today’s digital world, it’s easy to rely on computers and tools to do the task at hand. But with SEO competitive analysis, these SEO tools can only handle some of the work. The rest is up to your own analysis. Read the content – It’s still very difficult for a tool or program to read a piece of content and truly know if it is good or not. And no, the number of keywords it has versus another article does not positively correlate to SEO success. Therefore, qualitative research by human eyes is required to judge the quality of a competitor’s article or blog post. Judge the natural use of keywords – Google is smart and can see through keyword bombing instantly. But it’s difficult for it to judge if keywords read awkwardly and are used unnaturally. During your qualitative analysis, you may gain insight into effective ways to use targeted keywords and ineffective, spammy ways to not use keywords. Predict most-clicked pages – Question: if a link at the top of a navigation menu gets more clicks than a link later in the menu, is that topic more popular than the latter? Or does it simply receive more clicks due to its prominent position? Only human intuition and A/B testing can truly answer that question. Name internal links – Effective website navigation isn’t isolated to the menus themselves. It also involves the effective naming of menu items within the navigation, giving visitors insight into the webpage behind each link. SEO competitive analysis tools simply can’t provide information on these naming conventions. Thus, qualitative analysis of your competition may provide both effective and ineffective ways of naming navigation links. As you can see, there is a lot to learn about SEO competitive analysis. And this process never ends. But the rewards are worth it, as almost all successful websites frequently study their competitors. The frank Agency has a wealth of experience in SEO competitive analysis. We’d love to share with you all the tricks of the trade. Contact us today to learn more!